As this week’s Bat-Bronze-Beauty tackles the Dark Knight’s eponymous title, I thought I’d talk a little bit about one of Batman’s most appealing characteristics: His look. Simply stated, Batman may well be the best-designed superhero in the history of comics. Again, Bob Kane took the lion’s share of the credit for Batman’s design, but Bill Finger was instrumental in coming up with some of the most iconic aspects of Batman’s design. Kane’s original Batman (nee Bird-Man, then Bat-Man) wore a red union suit with no gloves, along with a simple domino mask and Da Vinci-inspired bat-wings. It was Finger who suggested the cowl and scalloped black cape, as well as losing the bright red in favor of a more nighttime-friendly black and gray color scheme (over the years, as with Spider-Man, colorists’ usage of blue highlights on the black parts of the outfit came to be interpreted as the primary color, turning Batman’s costume from black and gray to blue and gray… or, as the 1969 Big Little Book led me to believe, blue and purple). By the early 1940s, Batman’s costume had evolved to what it essentially remains today. There was a brief (no pun intended) period in the late 1990s when Batman lost his outer shorts (lots of fanboys hate that fading sartorial superhero choice), but you can’t muck around with an icon. He just didn’t look right, and so the shorts quickly returned. Much of the genius lies in how certain elements of Batman’s design are ripe for a wide range of interpretations. Artists, especially in recent years, have given much thought to the size and shape of Batman’s cowl (eyes and ears particularly), chest-symbol, cape, utility belt, even gauntlets and boots, creating dozens if not hundreds of unique variations on the basic costume design. Most of these variations owe a huge debt to Neal Adams. In the late 1960s, Adams was breaking new ground in comics, bringing an illustrator’s mentality to the medium. While he never lost sight of storytelling (the primary objective, after all), Adams combined realism with stylization to unparalleled effect. His Batman looked like a real person, but reality went out the window when Batman lept across the Gotham rooftops as his cape suddenly billowed to a hundred feet. It didn’t matter that the varying cape length made no sense, it looked AWESOME. The effect was immediate: artists were liberated, and every Batman artist since has taken from Adams, either directly or indirectly. Adams drew the cover and interior for BATMAN #251 (Sept. 1973), one of the greatest Batman comics of all time. “The Joker’s Five-Way Revenge,” written by Denny O’Neil returned Batman’s greatest arch-enemy to his original homicidal madness after decades of being portrayed as just a clownish robber. Featuring some gruesome murders, the return of the toxic Joker venom, Batman battling a shark and a final chase across the beach, it’s one of the most reprinted Batman stories in the character’s history. 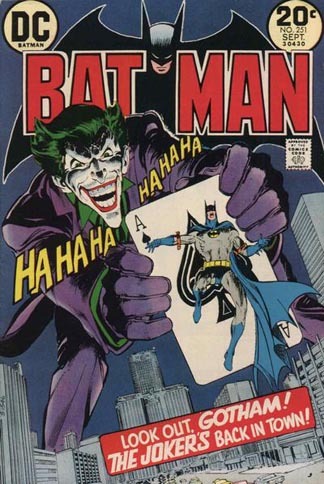 (Although it should be noted that Adams' fashion makeover of the Joker, putting him in a modern business suit and tie, thankfully didn't take hold, and I have to wonder why Bats is strapped to an Ace of Spades and not a Joker up there). My second choice, ironically, is by an artist who was not usually right for Batman. Curt Swan was THE Superman artist from the 1960s through the 1980s, until John Byrne’s yuppie revamp of 1986. Another illustrative cartoonist, Swan was best known for his realistic depictions of people, which left his Batman often a bit stiff and unimposing (by contrast, his Superman seemed casual and regal, something captured perfectly by Christopher Reeve on film). 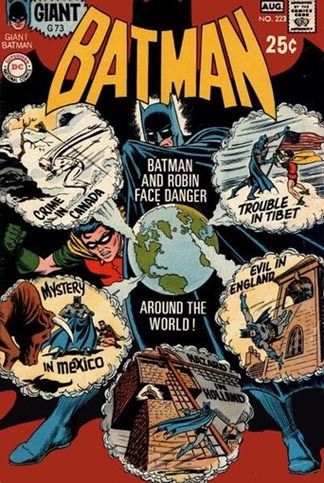 But, teaming with inker Murphy Anderson, Swan’s cover to BATMAN #223 (Aug. 1970) is a thing of beauty. This giant issue reprinted some rather tepid globetrotting tales from the 1950s, but the cover (complete with alliterative captions) raises the bar on the whole package. It’s breaking format, but what the heck, I’m adding a third cover to this entry (there are just too many great BATMAN covers). 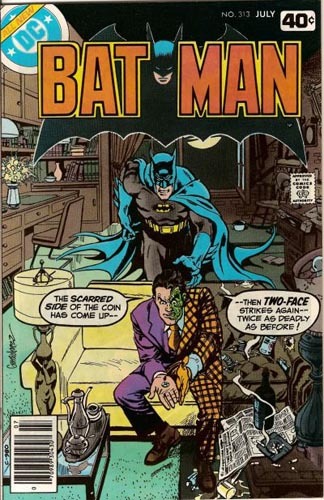 BATMAN #313 (July 1979) by José Luis Garcia-López makes exemplary use of the design motif of Two-Face, another of Batman’s greatest villains. First introduced in 1942, the scarred former District Attorney Harvey Dent was killed off after a few appearances and resurrected (often with different aliases) sporadically over the years, finally returning as a major player in (you guessed it) the 1970s. Due to his gruesome visage, the character was never used in the BATMAN TV show, nor any of his early cartoons. BATMAN FOREVER’s ridiculously over-the-top depiction of Two-Face (mysteriously renamed “Harvey Two-Face”) was one of that film’s innumerable problems. The 1990s BATMAN: THE ANIMATED SERIES made great use of the villain’s scarred dual-personality, and I am jazzed to see Aaron Eckhart’s portrayal in THE DARK KNIGHT. Next Week: Batman teams up in BRAVE AND THE BOLD!